What do you call a recipe like this? 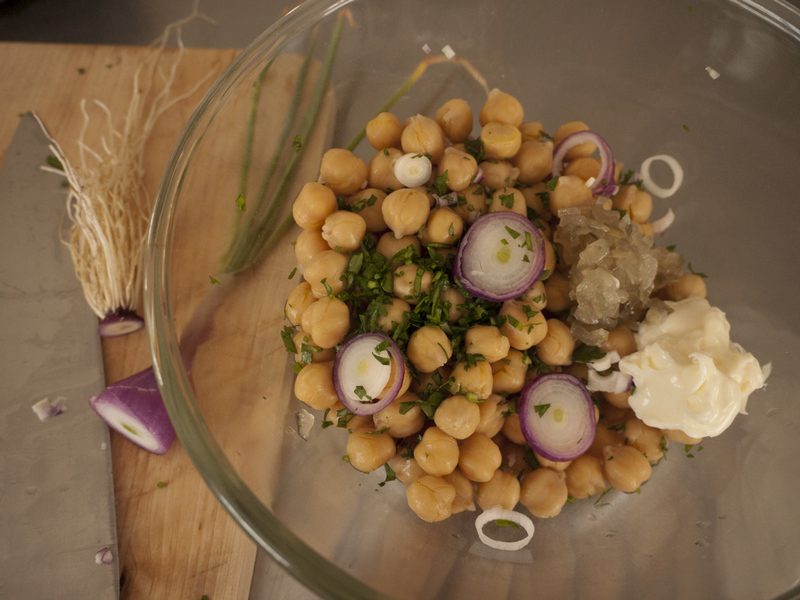 "Chickpea of the sea" is a little too cute, but "garbanzo bean salad" could be anything, and "mock tuna salad" sounds like one of those recipes that starts with a box of crackers and a can of cream-of-something soup. 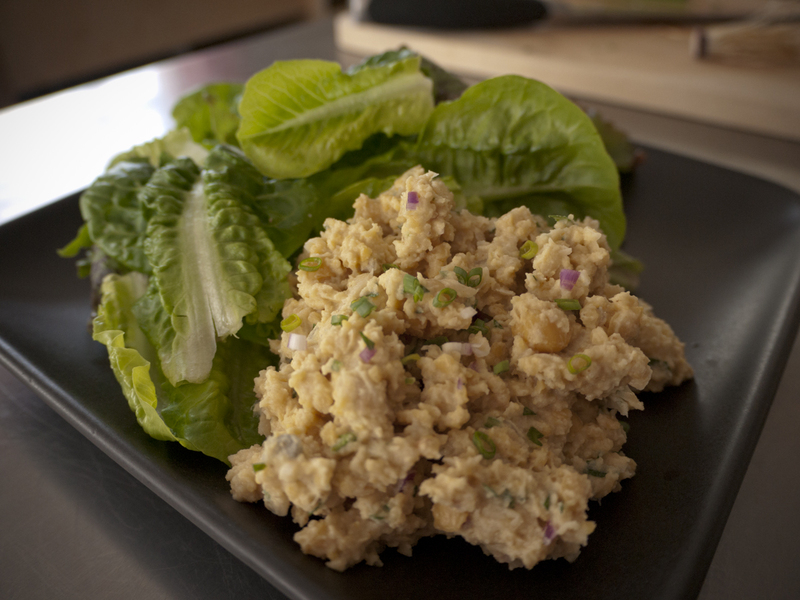 Whether or not you're actively avoiding tuna, you should definitely try this version the next time you're making lunch. 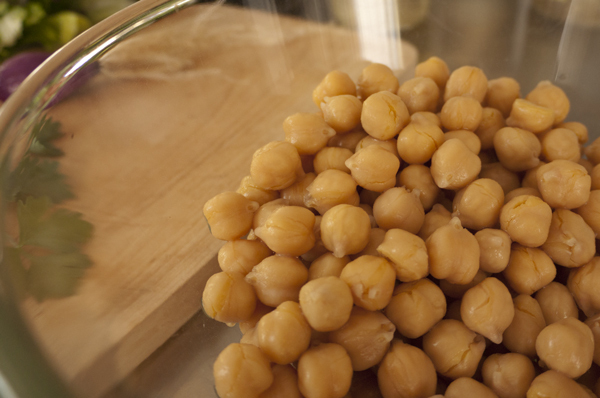 It's really easy to buy dried chickpeas in the bulk bin, cook a big batch until they're tender, then drain and freeze them in convenient portions that you can thaw out as needed. But you know what's even easier? Using the canned chickpeas that you have in your pantry, because you still haven't gotten around to boiling the bag of dried bulk bin chickpeas you bought two months ago. Chinese celery (or cutting celery, or Apium graveolens) is one of my garden favorites. 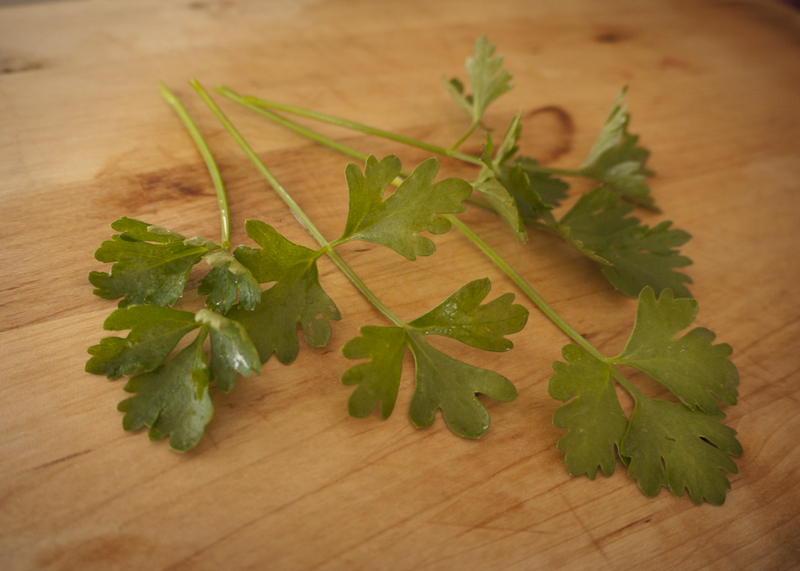 These are the baby stems — they look like parsley, but with the distinctive celery taste. 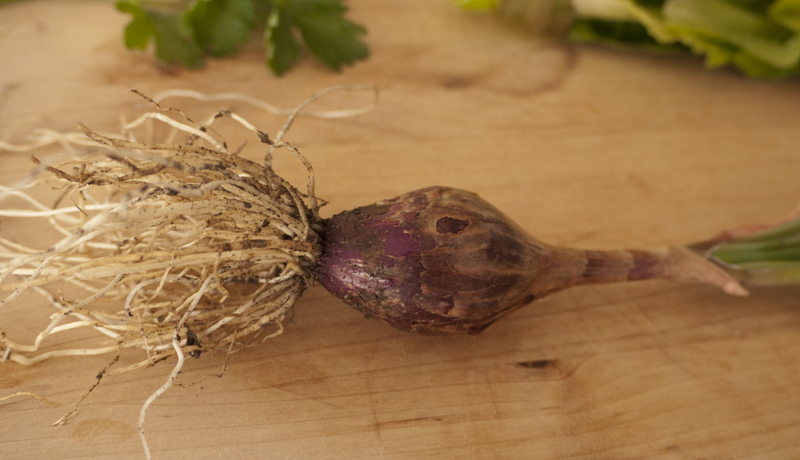 When grown, the stalks look like ordinary celery, except that they grow in a loose bunch instead of instead of being tightly clustered — handy if you just need a few stalks at a time. 1 dollop pickle relish and/or mustard, if you like. I like pickle relish. Hate pickles. Like pickle relish. But only in this kind of thing. 1 or 2 shakes of any spices you like: cumin, coriander, celery seeds or celery salt, pepper, garlic salt, etc. I used 2 shakes each of cumin and coriander. Chopped celery, onion or scallions, walnuts, apples, carrots, sesame seeds, water chestnuts, jicama, etc. I used onion and baby celery. You could take this just about any direction. The first version I saw of this was on the Kitchn, and included umeboshi vinegar. Some commenters suggested dried seaweed for a more "fishy" flavor. 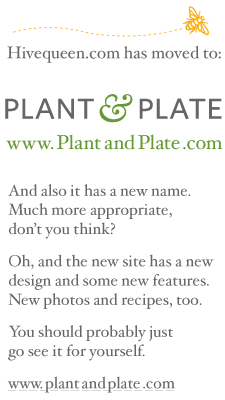 Other versions out there include olives and more pickles, or cayenne pepper and raisins, or nutritional yeast and cider vinegar, or garlic. Anything you put in your tuna salad, and plenty of things you wouldn't. Put the chickpeas, moist ingredients, and flavorful stuff (mustard, spices, salts) in a bowl and smash it all up with a potato masher (or a fork, if it's a sturdy one and you have strong arms). Or put everything into your food processor and pulse it a few times. Don't go overboard — it's nice if it has some texture. Taste it and adjust the seasonings. If it's not as moist as you like, add more mayo, tahini, yogurt, or whatever. Stir in the crunchy ingredients last. You can make this in advance: it keeps just fine a day or two in the fridge. Just cover it so it doesn't dry out. 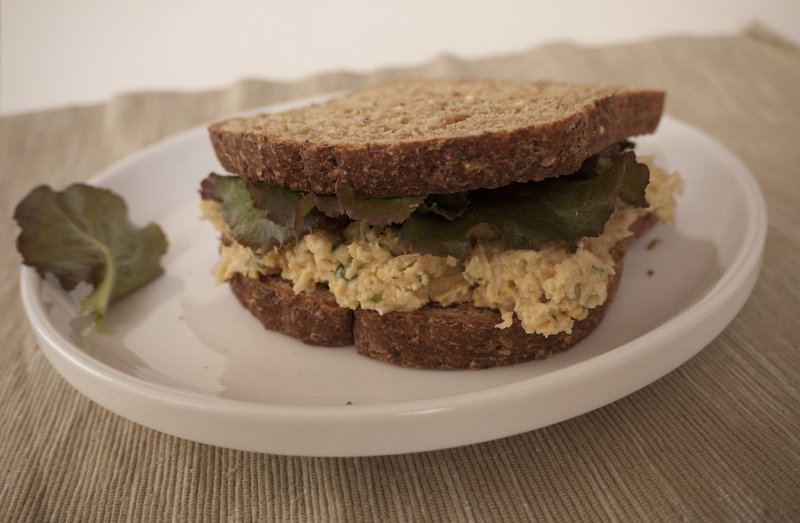 Makes a delicious salad and an even better sandwich.